Getting into diet addiction at a young age, Karen Jones Gowen spent a lifetime trying to get over it. Losing weight wasn't enough. She wanted to achieve and maintain a healthy size without diets, grueling workouts or strict weight control plans. In fact, to discover the secret to eating normally, instead of like someone who was either on or off a diet. In this self-help memoir, Gowen relates her own story with detailed authenticity. She shares the plan she developed over many years and with much trial and error. 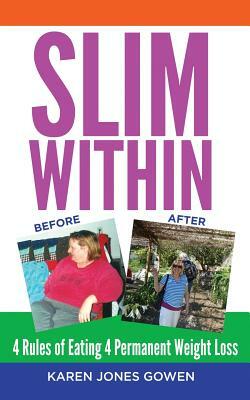 A plan that enabled her to lose 80 pounds and keep it off: the Slim Within program, with its simple 4 Rules of Eating. The final section of the book guides readers into understanding and implementing their own best way to lose weight by following this method of natural, appetite-centered eating. Utilizing Slim Within, it's possible to overcome a lifetime of diet addiction, or obesity, or any type of eating disorder and at last find peace with food, weight and body image. To become slim permanently, not just on the outside where it shows but inside where it counts.